My daughter just said the street is flooded. She thought they were pretty dry but water coming up thru the carpet. Her in_laws isolated for at least 2 weeks. And a very nasty cell approaching. Hang on guys and gals. Words can't describe the magnitude of this event, just amazing. despite the RR Dam gates being opened wider today, inflows are still outpacing outflows, dam now up to 216%. a week ago it was 65%! dam gets expected to be opened further tonight making flooding around hermit park, rosslea, railway estate worse. Council said that if the heavy rain continues, ie 200mm+ then its possible that up to 20,000 townsville homes could be effected by flood waters by monday. We've had the a/c on dry all day here. Has worked well, but you can tell it's working hard to maintain it. Our total from Sunday to now has been 959, just started pouring again. Never thought I would want a reprieve from the rain but here we are. A few friends in riverside suburbs have gone to higher ground. We've got the aircon running in one of the room and it has helped - but the smell being drawn out of the carpet is just YUCK. Incredible event continuing up there for you guys. I remember the years of frustration of 'Brownsville' posters on here and now you're getting hammered. Looking at EC, you have another possible 1.5 metres of rain coming in the next week. However, other models only have a couple hundred mm max. For the locals up there, what would that mean for you if EC's forecast happens? Is the 20,000 homes flooded an optimistic estimate or the worst-case scenario? Just tipped out another 75mm here in West End, fell in the last 2 hours!! I am told 20,000 is conservative. Authorities scrambling right at this minute with evacuations. My family there cannot believe the amount of water. Yep its totally mind blowing...and it aint done yet..! No update on dam level or weir level for over an hour? I thought most homes up there would be tiles all throughout the house. Is the Ross River Dam at any threat if the projected falls occur? Surely continued falls would require a mass release of water and even that might not be enough to maintain dam integrity? How much higher than 213% can it go? Is there a graph that shows Ross River Dam levels by metres? I can only find the percentage capacity data. 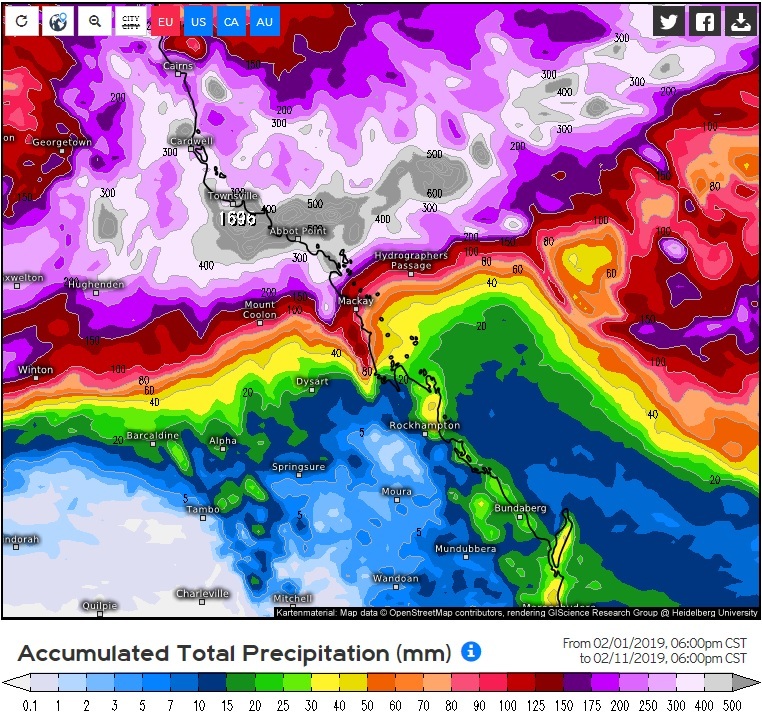 The way this is developing brings back a lot of memories of the 2011 floods in Brisbane/SEQ. We had the same situation with dam capacity and insane amounts of rainfall, although yours is clearly even worse. All the best for you guys up there. 10 registered (Knot, Mike Hauber, sebbie78, Steve O, Adaminaby Angler, wet sky, bbowen, scott12, 2 invisible), 60 Guests and 3 Spiders online.